The classic Chinese tale of The Three Kingdoms—with all your favorite historical figures cast as cute girls! As the Han Dynasty collapses, two mighty warriors—Zhang Fei and Guan Yu—stand strong against the tide of rebellion. 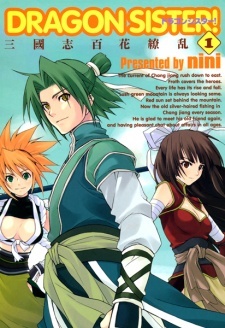 But because these fighters are female, their dreams of fighting in the Imperial army are nothing but dreams...until they find a patron and like-minded brother in Liu Bei, an idealistic descendant of royalty with dreams of his own. Forging a pact, the three form a volunteer army dedicated to restoring peace, which means first defeating three deceptively adorable sisters who oppose them, and who have their own, definitely cuter, plan for China's future... One thing's for sure—history's about to get a makeover! Dragon Sister! : Sangokushi Hyakka Ryouran was partially published in English as Dragon Sister! by Tokyopop, who published the first two volumes from April 1, 2008 to August 12, 2008, before the publisher became defunct.